Today I have a very special blogger friend of mine here who is known for her healthy vegan recipes, gorgeous food photography and radiant personality. She is none other than Harini aka Sunshine Mom. This lovely lady lives up to her name Sunshine Mom by spreading her warmth, kindness and her sparkling personality shines through her delectable blog Tongue Ticklers which is a treasure trove of vegan recipes, beautiful narration and stunning photography! 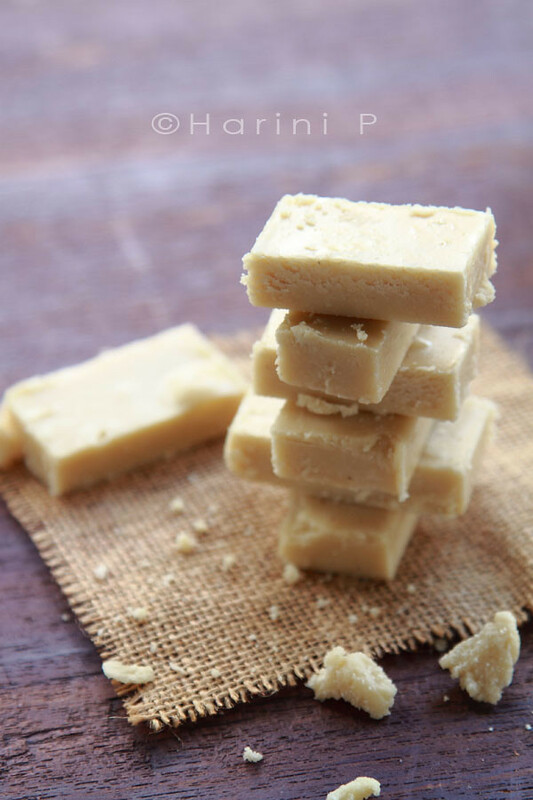 Please welcome Harini who is sharing her delicious Vegan Kaju Barfi recipe with us all and don’t forget to become her fan on Facebook and follow her on Twitter. Sia and I have been acquainted for quite a few years now as Monsoon Spice is a blog that I frequented often as a new blogger. It is my privilege today to be her guest blogger. The recipe I am presenting today is my signature dish, one that all my guests love and one that I have shared the recipe for, with many people! It is a regular feature in my house during festive occasions. 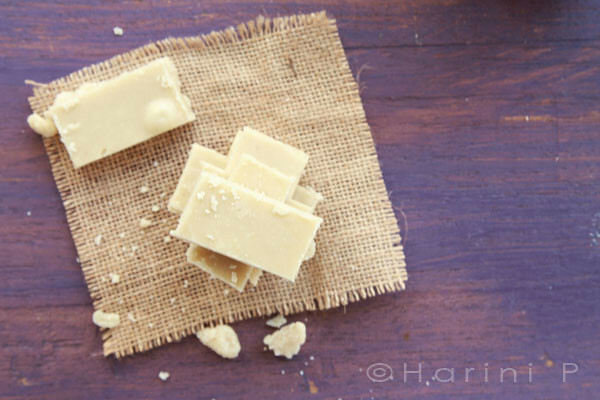 This Kaaju Barfi recipe is simple and I assure you that you just cannot go wrong! The fragrance of cashews and cardamoms is unstoppable and will linger for sometime in your house even when the sweet is packed and stored. 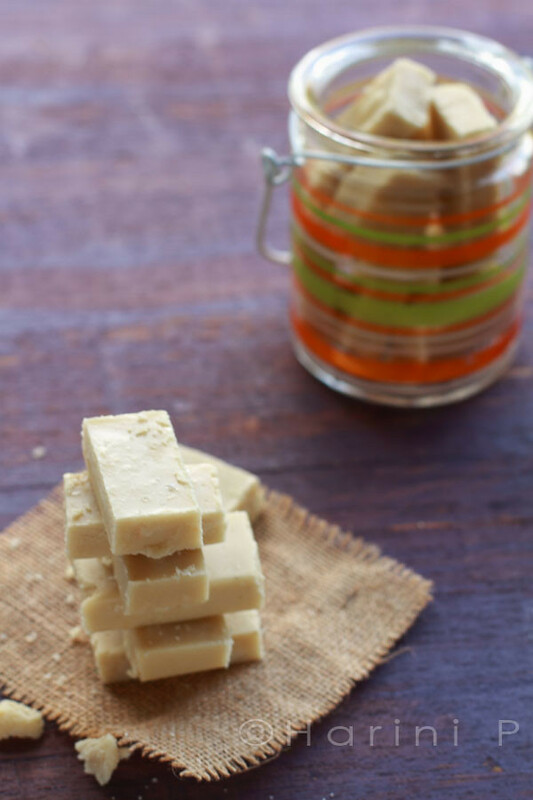 Unlike shop bought barfis, this recipe does not contain any fat, additives like arrow-root or milk that dilute the taste of cashews. Store in a clean, airtight box. These last for a fortnight at room temperature easily but I wonder whether they will last even a day as they are not the kind of sweets that go untouched! A gorgeous treat! Those candy squares look delicious. Thank u dearest Harini for these vegan delight. I have tried them and they r simply the best tasting kaju barfi I have ever had. my lil dumpling adored them :) I'm honored to have u here in MS kitchen! Beautiful is the only word! I love Harini's photos and recipe :) looks simple yet decadent. This is one of my most favourite sweets! Could do anything for that piece right now...Harini can I have one please? Looks perfect and so so good. Wonderful to see Harini here! and I have eyed those burfis long enough in Flickr. Good to them here with a recipe. Lovely Lovely photos as usual Harini. Tried this recipe the minute i saw your snaps and it came out perfect and delicious! Thanks for sharing.. Thanks for having Harini over Sia! Hi Harini, first thanks to you I got to know of Sia's Monsoon Spice. looks interesting. will look thro it in detail later. 1.the cashew packet that I got mentioned to wash before before using. So I did that and laid it out on a cloth to dry for an hour. is that ok.
2. I then powdered the mixture. I expected a more fine mixture.mine was more coarse-like rava. So I mixed some more, but it turned paste like. 3. Then I made another cup of cashew mixture, this time stopping when it reached the broken rava like powder. otherwise both tasted good.i used unrefined raw sugar. I have stopped using refined white sugar. Also a huge thanks to warm words from visitors here! Ramya, I am so glad you tried out and can vouch for its deliciousness! Bharathi, yes, it is perfectly alright to wash. In that case dry immediately with a napkin. Lay in shade till they are completely dry but they will still have moisture within. So you got to keep them in the fridge without a cover for a day or two to help them firm up. That way they won't turn pasty. Both do come out well (whether paste or powder) and the texture is more a matter of preference than anything else. I like mine with melt in the mouth texture. When I used unrefined sugar I found that the texture was slightly different. I used lesser quantity than white sugar as unrefined sugar is quite sweet. But while making this one, I used white sugar to bring out the white colour. Hope that clarifies.